Kim Kardashian West: Maybe they are in a fight. North West: Maybe they are in a fight because she secretly hated this because it was too cold and muddy. Beck: Maybe Kanye’s at-mentionless Twitter apology wasn’t enough. Beyoncé: Maybe she is mad he didn’t go full Kanye at the Grammys this year. 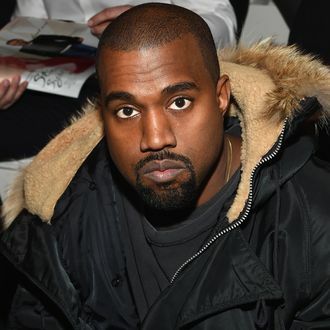 Zane Lowe: Maybe he thought it was funny that Yeezy cried during their interview. Drake: Maybe he’s gloating because his whole album is charting. Taylor Swift: Maybe their dinner was weird. Olivia and Meredith: Maybe it was a wonderful dinner, and these two were jealous they weren’t invited. Mike Dean: Maybe he was mad that Kanye almost forgot to wish him a happy birthday today. THERE WOULD BE NO FIX, NO WATCH THE THRONE, NO COLLEGE DROPOUT, NO GOLD DIGGER WITHOUT YOU BRO!!! !